When a Facebook account is deactivated, it can be restored by simply logging in with your Facebook user login details. You can deactivate your Facebook account in case you want to get rid of Facebook temporarily. On the other hand, if you want to leave Facebook forever and do not want to come back, you can delete the account permanently. 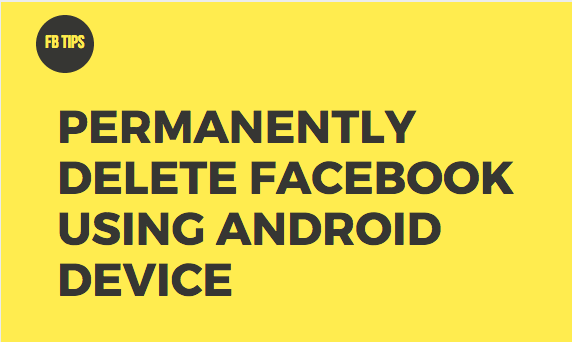 The Facebook app that almost all Android smartphones have only allows the users to deactivate their accounts. In order to delete your Facebook account permanently using your Android mobile phone, you must consider using the mobile version of the web browser instead of using the conventional Facebook app, and after signing in to your Facebook account from the browser, you must use a particular URL that will redirect you to a new page from where you can permanently remove your account profile off from Facebook. 10. Finally, tap OK to permanently delete your Facebook account.